Maya Wellness | Love Life! Learn & Expand. I left out the chopped candied ginger. Instead of butter, I used melted coconut oil. Instead of sweet potato, I used pumpkin. 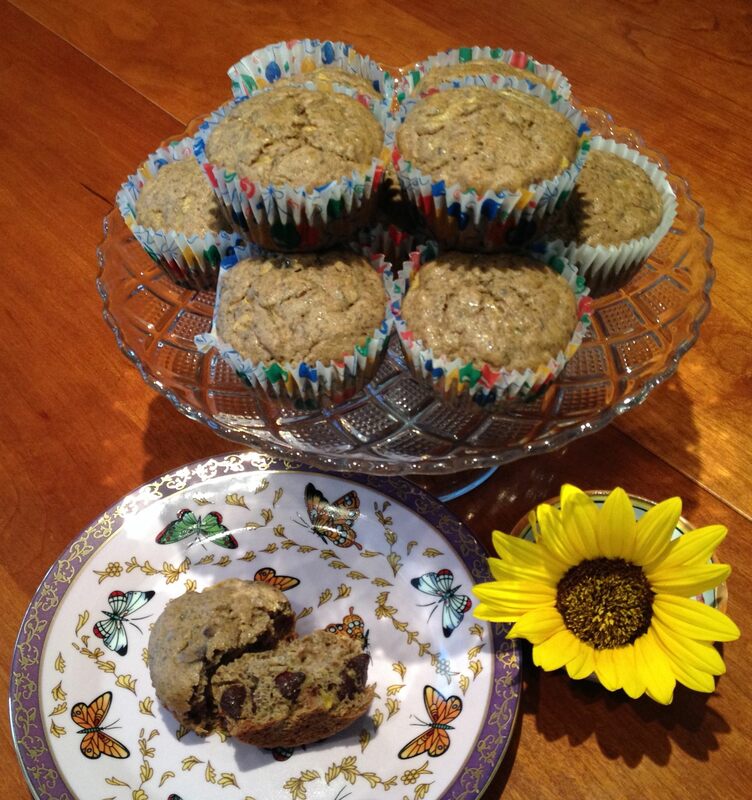 Instead of brown sugar I used coconut sugar. I also reduced the molasses to 1/4 cup. 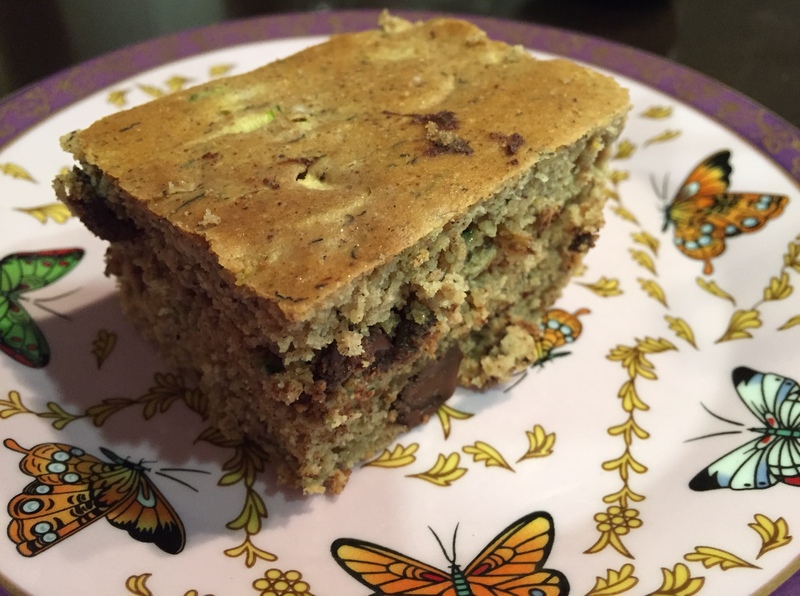 Finally, I use gluten-free flour and added a little pumpkin pie spice to the mix. Next time I will add a teaspoon of vanilla. 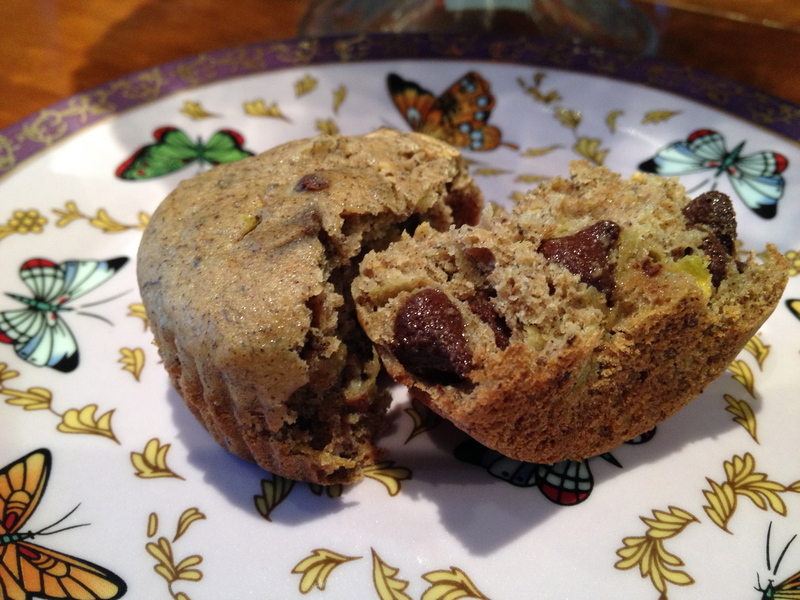 These muffins turned out very moist and are delicious! Enjoy! I love the fall with that certain smell in the air, cooler weather, and the colorful leaves. I also love the bounty of the fall harvest with winter squashes like pumpkins available! 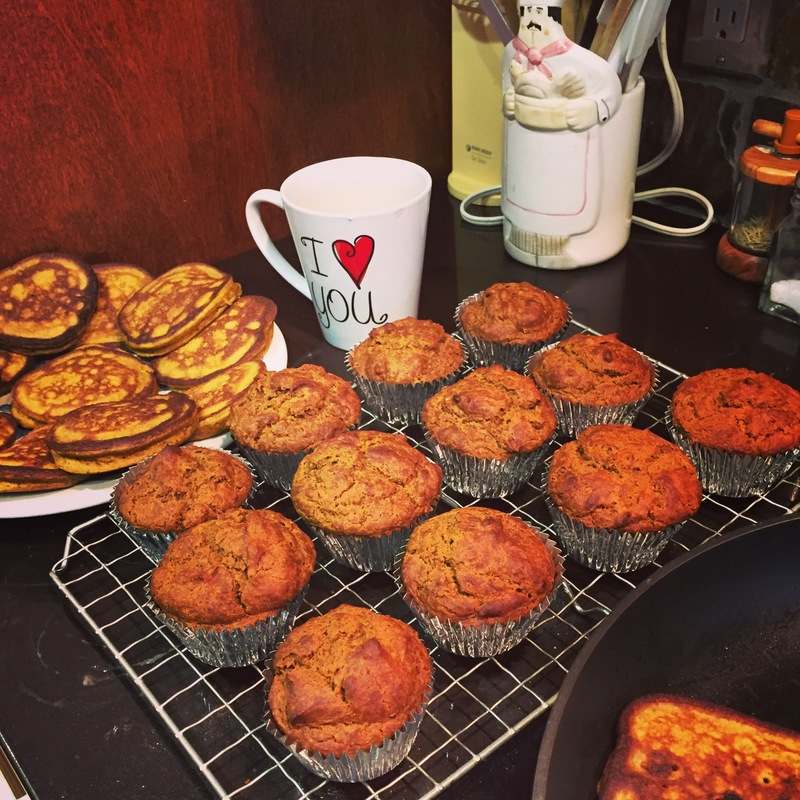 Recently I decided to experiment and make some gluten-free and dairy-free pumpkin pancakes. It was actually pretty easy with a few substitutions/additions. They are delicious! Add flour mixture to the wet mixture and combine until all dry mix is incorporated. Stir in chocolate chips and nuts if including them. 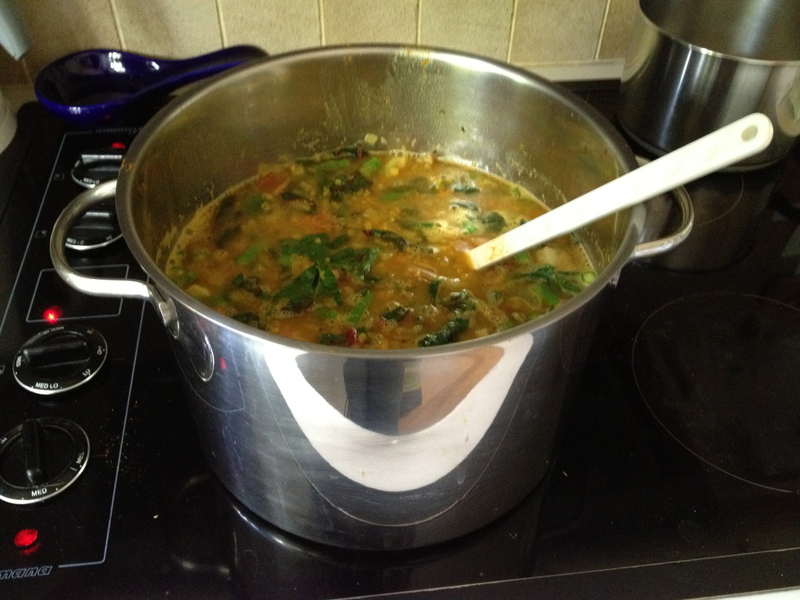 In doing a little research, I found that there aren’t many good recipes online that follow this diet, so I wanted to share the soup recipe that I made with my client. She gave me a list of the foods that she does well with right now, so for some people there may be ingredients to leave out or others to add in. You can easily alter this to use a wider variety of vegetables. First, I wanted to find a way to have good flavor for the soup without any onions, garlic, fennel or other FODMAPs foods. So the first step was to cut the leafy green part off of chart stalks. Set aside the greens to use later, chop the chard stalks into small pieces. We also used a small amount of celery, chopped. Add: cumin, coriander, turmeric and a little cinnamon and stir. I always add seasonings by feel, so you may want to play with the above amounts to fit your taste buds. Add ~8 cups of water and bring it to a boil, then turn down to simmer. It’s helpful to boil it ahead if you can, so that it’s hot when you add it. Simmer for about 5 to 10 minutes until everything is cooked. – When you re-heat a serving of soup, you can beat one egg like you would to scramble it, but then add it to the boiling soup. The heat will cook it and you’ll have a thicker soup. – Add a little bit of lemon juice, mustard or other condiment that you can have. – You can add any cooked meat to the soup. Simply cut into small pieces and add in. – A great way to cook up ground buffalo meat (or other ground meat): put salt into a frying pan, turn onto medium high and once the pan is hot add the ground buffalo meat. Salt it some more. Break it apart and stir it around as it cooks. Once it’s completely done, you can add the cooked meat to soups or veggie mixtures. Bone broth is actually very easy to make at home and also very cost effective when you use left over carcass bones that you’d otherwise just throw away. My family has been making bone broth for many years. One of the tricks is to make sure you add vinegar to the pot, which helps to leech the valuable bone minerals into the water. Below are a few different recipes for bone broth. Get creative by adding your own combination of herbs and vegetables! Fill up a large stockpot (or you can use a large crockpot if you have one) with pure, filtered water. Add vinegar and onions, carrots, and celery to the water. Place the chicken bones into the pot. Reduce the heat to the lowest setting and let the bones simmer for 12-24 hours. Adding the fresh parsley about 10 minutes before finishing the stock, as this will add healthy mineral ions to your broth. Remove bones from the broth with a slotted spoon and strain the rest through a strainer to remove any bone fragments. A friend of mine, Veronica Rae, wrote a great article in the Huffington Post about setting intentions for the new year. She shares simple and easy steps to help you do it, too. Click on the link below to find out more. For many years now, I have setting an intention for the year. Why? Well, it helps me stay tuned in and on my path for the year. 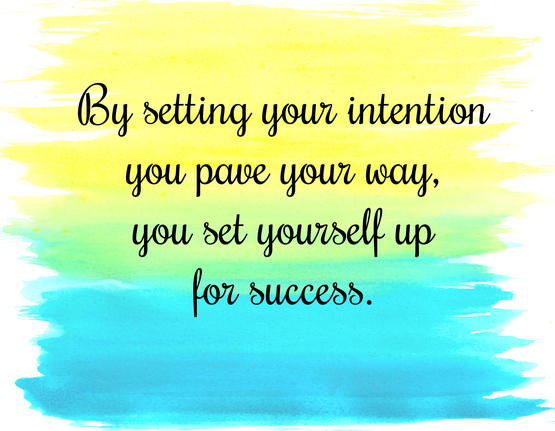 Setting an intention helps me connect with my Spirit’s plan for the year. It’s freeing to let go of making resolutions that I can’t keep. Just like Veronica suggests, I center myself, let go of expectations, make sure I’m grounded (i.e. connected to the center of the earth) and in a clear space (feeling calm and peaceful). During the whole process I tune into my intuition. In my mind I ask, what is my intention for this year? Information comes to each of us in different ways. For some people it’s in images, for others it’s in words or feelings, and for some it’s a deep knowing. Whatever works for you is perfect. For me it’s helpful to allow colors and images that represent my intentions to show up. Usually the first color or symbol that comes is the right one. It represents the qualities of what I want to create and what I am working on during this next year of my life. Sometimes I count to myself: one, two, three. Now! And then notice what the first color or symbol is that appears in my mind’s eye. 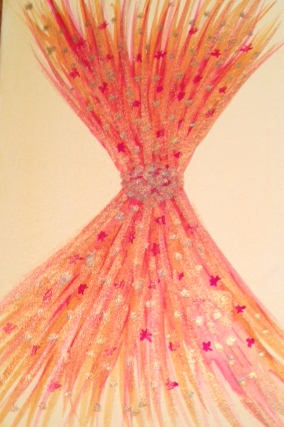 For the past two years I have done water-color paintings of my intention symbols. The image to the right was my over-all symbol for last year (2014). It has hung in my bedroom as a wonderful reminder all year. I have shared two examples of ways you can tune into your intention for the year. There are may more. Have fun playing with these exercises and see what works for you! Blessings for an amazing year! !